This console cabinet features electronically actuated to make it easier to load and unload china and glassware with full hands. Just a soft touch by a knee or elbow can activate opening and closing! 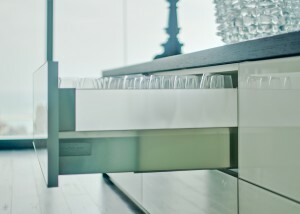 We are so excited to be using these innovative drawer features. We’ll add project photos to our Portfolio upon completion!